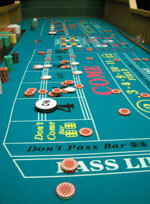 All the fun of a Casino and No Risk? You Bet! when you throw a Best Bet Casino Party! We bring everything from the equipment to the dealers, from the initial stake of FunBux to the exciting prize awards. And it’s all just $15-$18 per guest, on peak dates in the Fox Valley! Prices lower on weekdays and in low season. Travel outside the Fox Valley may increase prices. Best Bet Casino Parties are available anywhere in the State of Wisconsin, and in neighboring areas of the Michigan UP, Minnesota, Iowa, and Illinois. We are proud to belong to the National Association of Casino Party Operators — the only nationwide organization of gaming party professionals, ensuring that you get only the best!